Ideal opportunity for singles, couples and small groups to experience the beautiful Lake Kariba easily and cost effectively! Lake Kariba although not as easy to access as Victoria Falls or Chobe National Park, is one of Zimbabwe's prime destinations and well worth the effort in getting there. The world's largest man-made lake, at one time, is home to phenomenal wildlife and the scenery on and around the lake is breath-taking. 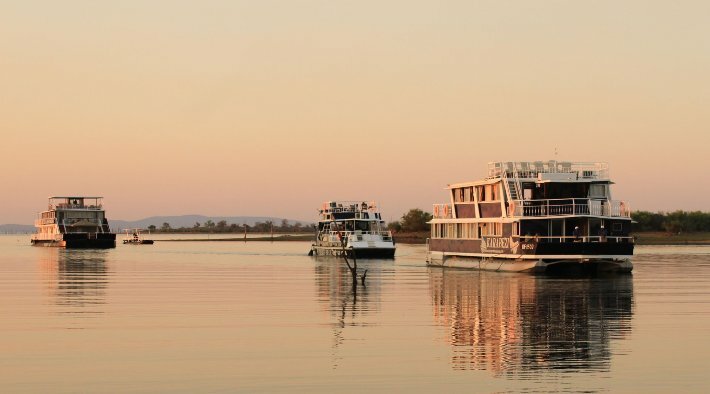 Its wildlife and safari opportunities cannot be overstated and now you can embark on a luxury cruise safari on one of Zambezi Cruise Safari's vessels. 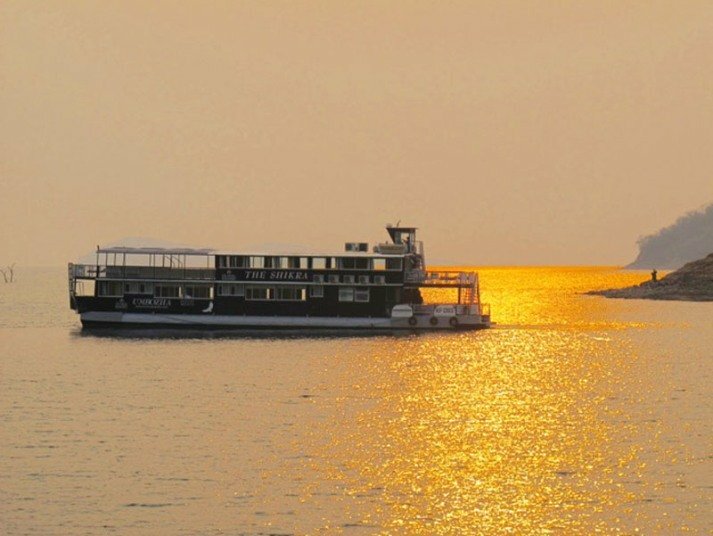 Either traverse the lake completely from Kariba to Binga or enjoy two and three night circular cruises (see itineraries below). The fundamental difference between these cruises and other Kariba houseboat safaris are the set departure dates that individuals, couples or small groups can join without having to hire the entire houseboat, much like an ocean going cruise liner. Although private hire for larger groups can also be arranged. The Zambezi Cruise Safaris' three floating hotels are of different sizes to cater for varying groups and cruises (see below). They are fully air-conditioned with mostly en-suite bathrooms, covered lounge, dining area, bar and fully equipped kitchen. The facilities and rooms are beautifully designed to make you feel at home and although they're not "Luxury Cruise Ships" in a first world sense (possible 3-4 star) they are without doubt the best Lake Kariba has to offer. Lake Kariba is all about relaxing in the sun whilst cruising the lake and taking in the remarkable scenery, sundecks and jacuzzi pools make these boats ideal. Morning and afternoon activities included in the Zambezi Cruise Safaris are fishing, game viewing and bird watching on the accompanying tender boats. For those wanting a walking safari, this can also be arranged on demand. 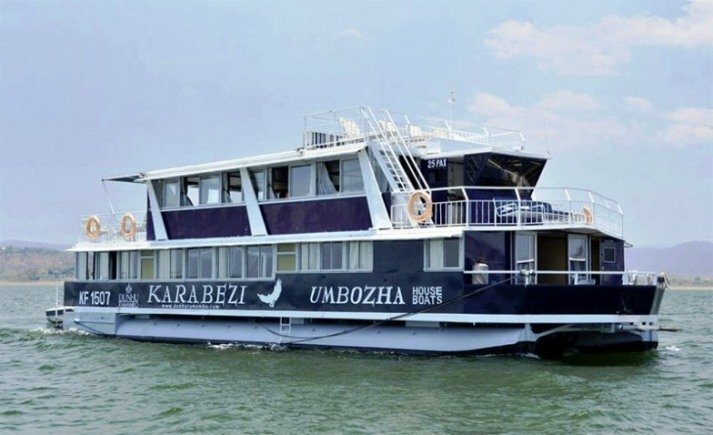 The flagship of the Zambezi Cruise Safaris fleet, The Umbozha Houseboat is one of larger vessels on Lake Kariba, with cabin-space for 28 people in five family cabins, two twin bedded cabins and two master suites with queen-size beds – all air conditioned, en-suite and have views of the lake. To accommodate additional guests, the main lounge has two full sized Indian day beds, a full sized Indian daybed on the pool deck, two double outdoor day beds on the back deck. For those wanting to sleep in the lounge area there is a separate bathroom and shower. For those sleeping outside on the deck, there is a separate toilet and shower on the first deck. All in all, the total sleeping capacity outside of the cabins is eight guests. • Crew: 4 - comprising Captain, chef and two deckhands. A host can be provided for an additional fee. • 9 air conditioned en-suite cabins. • 240V generator powers the lighting and wall sockets, as does a 12v battery system when the generators are not running. All plug points are UK Square pin (please bring suitable adaptors). Generally the main generators are switched off between 10 & 11pm as per lake regulations whereby the 12v battery system takes over until morning. • Basic fishing equipment is provided, but it is essential that any serious fishermen/women bring their own rods and tackle and make special arrangements for bait etc. 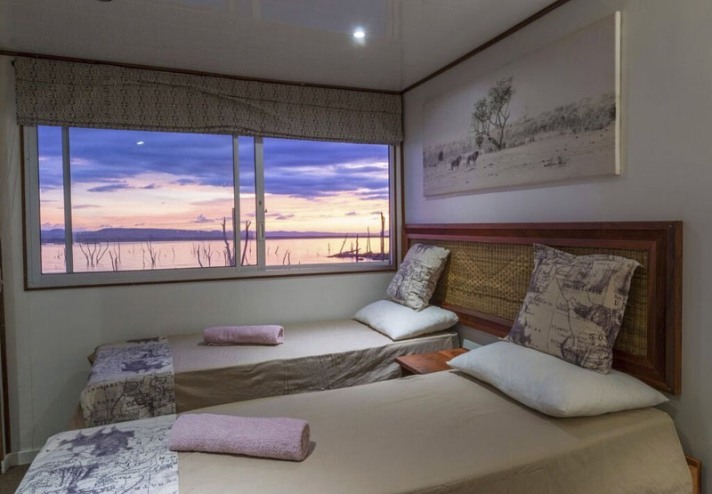 The smallest of the Zambezi Cruise Safaris fleet, The Karabezi has a capacity of 14 people - offering a more intimate Lake Kariba safari than the other two houseboats (Umbozha and Shikra). This is perfect for a large group wanting an exclusive itinerary, or for those who just want a less crowded accommodation option in Kariba. 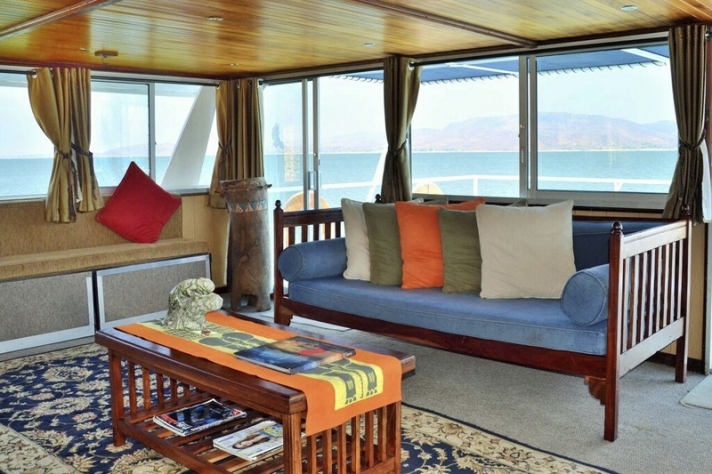 The houseboat is beautifully fitted with teak and furnished tastefully in a rustic style. The Karabezi has seven air-conditioned cabins, six of which are en-suite while one has a separate bathroom - all bathrooms have a shower, toilet and hand basin. For additional capacity, the houseboat has six fold-out single beds and a separate toilet and shower facility in the reception area of the vessel. The Shikra is one of the larger houseboats on Lake Kariba, with a maximum capacity of 30 people, with a dedicated staff of 5 crew members. It has 10 rooms, all en-suite and with two single beds which can be converted into queen-size double beds, and a fold-away bunk bed. All bathrooms are equipped with shower, toilet and a hand basin. 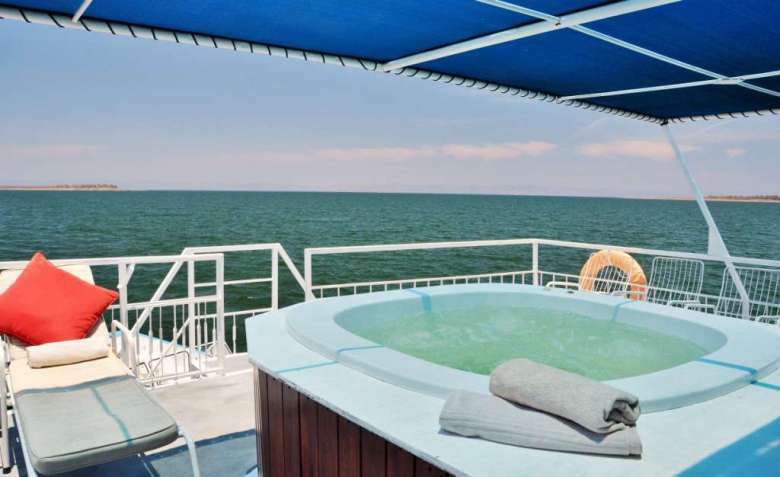 The biggest of the Zambezi Cruise Safaris boats, The Shikra offers plenty of open space for relaxing and entertainment and a rather large shaded plunge pool on the second deck. 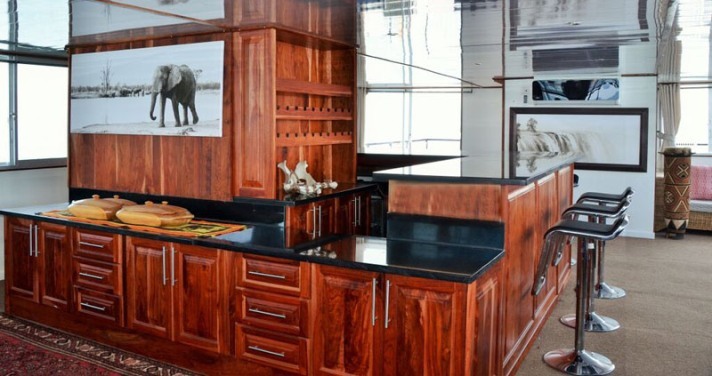 The lounge & dining area also on the middle deck are tastefully furnished with a beautiful teak & granite bar. • Crew: 5 - comprising Captain, chef and deckhands. A host can be provided at an additional fee. Kariba is one of Zimbabwe's totally undersold destinations, anyone who has been there would vouch for its beauty and tranquillity. These cruises now offer the ideal opportunity for singles, couples and small groups to experience this fabulous destination easily and cost effectively. In addition if you are trying to get from Kariba to Binga or visa versa then what better way to do it. We found the boats themselves to be of a high standard and after experiencing the quality of this trip, we are very excited to be able to promote and offer the product to our clients. 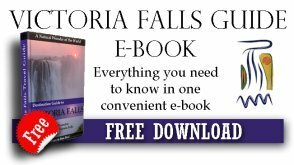 What a stunning add-on to Victoria Falls or a safari in Hwange! On a typical day enjoy an early morning game viewing cruise or you can try some famous Kariba fishing for Bream, Cornish Jack or the renowned Tiger Fish on one of the tender boats. Walking safaris or a game drive deep into the Matusadona National Park are optional extras which are conducted with the sister lodged on the mainland. After the morning activity, breakfast or brunch is served before you kick back and relax with a cool drink, a dip in the pool (or jacuzzi, depending on the boat you're on), or simply take a nap as the boat cruises on to the next overnight mooring. Spend the late afternoon exploring the nearby creeks and inlets with their resident hippo, crocodile & wildlife populations and enjoy the outstanding birdlife and fishing opportunities this lake presents. In true African safari style, a sundowner drink and snacks are in order as you are inspired by one of the best sunsets you will ever witness. Zambezi Cruise Safaris' set itineraries are detailed below and can also be combined with one of the mainland lodges for longer stays. Tailor made itineraries are also possible please contact us for details. Cruise across the Lake to the Matusadona National Park to the first night mooring in a secluded bay or river inlet. Scrumptious local fresh cuisine often utilizing fish caught during the trip. Daily activities are of YOUR choice from the tender boats, the options being fishing, game viewing, birding or simply taking in the magnificent views as we explore the rivers and bays of this part of the lake. There are optional extras of walking and game drives deep into the national park from one of the partner lodges. Early morning departure for an interesting road transfer from Victoria Falls or Hwange to Binga/Milibizi. 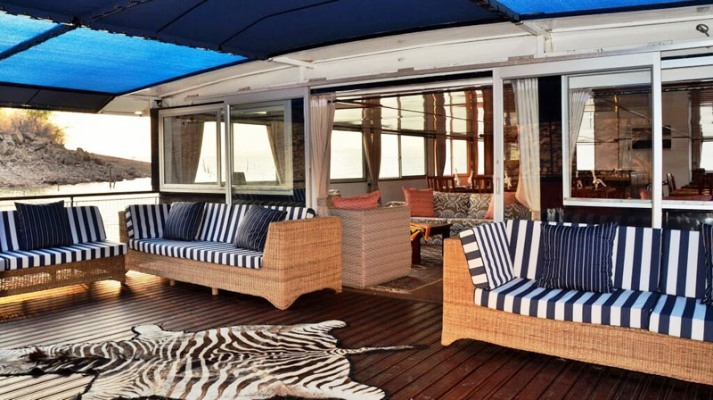 Board the Zambezi Cruise Safaris vessel and depart mid-day, cruising to the Sengwe River for an afternoon sunset / wildlife cruise of the Sengwe River followed by a beach Braai. Leave the river that evening after dinner to cruise the lake to the Bumi Basin where the next day is spent on wildlife activities of choice with the option to book a walk or game drive from a partner product. Late afternoon sunset cruise with sundowners followed by dinner on board whilst the boat cruises overnight to Kariba town for your onward adventure. Early morning departure from Victoria Falls or Hwange National Park to Binga arriving for a mid-day departure cruising to the Sengwe River. Evening activities & sunset wildlife cruise down the Sengwe River followed by drinks and dinner on board. Early morning activities of fishing, guided walks or game viewing followed by brunch whilst cruising to Elephant Bay where the Zambezi Cruise Safaris boat will moor on one of the Island’s with a sandy beach. Relax around a camp fire and watch the sunset over the lake followed by a beach braai. Morning activities and cruise back to Binga/Milibizi and your return trip to Victoria Falls or onto Hwange National Park. These are not included in the Charter fee and are payable to the Parks representatives at the boat prior to embarkation. Parks officials may board the boat at any stage to check that payments are accurate and have been properly receipted. You may wish to let us know in advance exactly who is coming, relevant ages, residential status and how many people will be fishing, which we will pass on via the boat captain to save time before you embark.